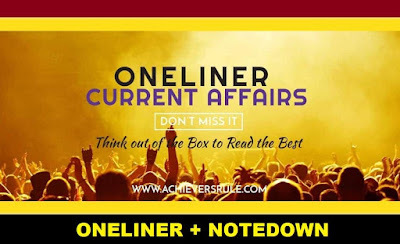 One Liner GK and Note Down Points for 12th April 2018 has all the important headlines based on the Latest news headlines. These are very important for the upcoming government examinations of Bank, Rail and SSC. Based on today's News Updates some of the news points have been pointed out here. Along with that we have also included some Note Down and GK Points so that it becomes easy to revise before the examination. The Asian Development Bank has said, India's economic growth is set to rise to 7.3 per cent this fiscal and further to 7.6 percent in the next financial year, on back of GST and banking reforms. Isro successfully launches IRNSS-1I navigation satellite. The rocket was launched from First Launch Pad (FLP) of SDSC SHAR, Sriharikota. Jammu and Kashmir Bank has launched a special financing scheme named 'Add-on Working Capital GST' to help the state industry cope with the delay in reimbursement of GST under special tax relief. The Food Safety and Standards Authority of India (FSSAI) on launched 'Project Dhoop', an initiative aimed at shifting the school assembly time to noon to ensure maximum absorption of Vitamin D in students through natural sunlight. India and World Expo 2020 signed participants contract on for India’s pavilion in the prestigious World Expo 2020 held once in 5 years. The Union Cabinet approved the signing of Host country (Headquarters) Agreement between India and International Solar Alliance (ISA). Saudi Aramco, the state-owned oil company of the Kingdom of Saudi Arabia, has signed a pact with a consortium of Indian oil companies to jointly develop and build a mega integrated refinery and petrochemicals complex Ratnagiri Refinery & Petrochemicals Ltd (RRPCL), in Maharashtra. Shreyasi Singh won the 12th gold medal for India in Women’s Double Trap after beating Australia's Emma Cox in a shoot-off, on Day 7 of the Commonwealth Games. Kidambi Srikanth set to become World No. 1 player.